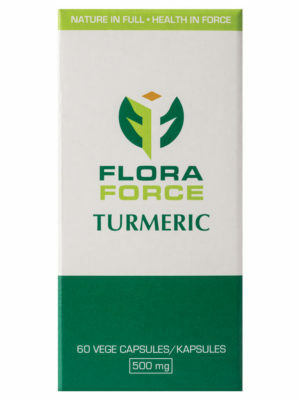 FLORA FORCE® TURMERIC capsules provide antioxidants for the maintenance of good health. Preliminary research suggests that turmeric and its constituent curcumin may have antioxidant effects. The capsules are free from sugar and lactose. Avoid taking FLORA FORCE® TURMERIC capsules if you are pregnant or breastfeeding. Information currently undergoing review, please refer to Professional Information below. A hypersensitivity to Curcuma longa. Biliary obstruction (bile duct obstruction and gallstones) (see “WARNINGS AND SPECIAL PRECAUTIONS”). Diabetes (see “WARNING AND SPECIAL PRECAUTIONS”). FLORA FORCE® TURMERIC capsules should be used with care in patients with cholelithiasis (gallstones) and should only be used after consultation with a physician (see “CONTRA-INDICATIONS”). When starting, or stopping treatment with turmeric containing products, including FLORA FORCE® TURMERIC capsules, patients with bleeding disorders should have increased monitoring of their INR (International Normalised Ratio) levels (see "CONTRA-INDICATIONS"). FLORA FORCE® TURMERIC capsules should be used with care in patients with diabetes as curcumin may decrease blood sugar levels. Diabetic patients should monitor their blood sugar levels when taking FLORA FORCE® TURMERIC capsules (see "CONTRA-INDICATIONS"). FLORA FORCE® TURMERIC capsules should be used with caution in patients with iron deficiency. Patient should monitor their iron levels (see "CONTRAINDICATIONS"). When starting, or stopping treatment with turmeric containing products, including FLORA FORCE® TURMERIC capsules, patients taking warfarin (or other coumarin anticoagulants) should have increased monitoring of their INR (International Normalised Ratio) levels (see "INTERACTIONS"). FLORA FORCE® TURMERIC capsules should be used with care in patients taking sedative medications, including Midazolam, as it may increase its sedative effects (see "INTERACTIONS"). Effects on the ability to drive or use machinery: No studies on the effect of FLORA FORCE® TURMERIC capsules on the ability to drive or operate machines have been performed. It is unlikely that FLORA FORCE® TURMERIC capsules capsules will affect the ability to drive or operate machines. FLORA FORCE® TURMERIC capsules may interact with the following medicines:. Curcuma longa, as in FLORA FORCE® TURMERIC capsules, may potentially increase the effect of oral anti-coagulants and anti-platelet drugs (e.g. warfarin, aspirin, clopidogrel, dalteparin, enoxaparin, heparin, ticlopidine) when taken in conjunction. Patients taking anti-coagulants or antiplatelet medicines should have their INR levels monitored more frequently when taking FLORA FORCE® TURMERIC capsules (see "WARNINGS AND SPECIAL PRECAUTIONS"). `Theoretically, Curcuma longa, as in FLORA FORCE® TURMERIC capsules, might increase levels of p-glycoprotein substrates. Some of these medicines include chemotherapeutic agents, antifungals, protease inhibitors, H2 agonists, calcium channel blockers, digoxin, corticosteroids, erythromycin, cisapride, fexofenadine, cyclosporine, loperamide and quinidine. Curcuma longa, as in FLORA FORCE® TURMERIC capsules, may increase the sedative effects of Midazolam. Patients taking Midazolam should use FLORA FORCE® TURMERIC capsules with caution (see "WARNINGS AND SPECIAL PRECAUTIONS"). There is some evidence that Curcuma longa and/or curcumin may interact with CYP3A4 enzymes and increase bioavailability of medicines metabolised by cytochrome P450 isoenzymes CYP3A4. Patients taking medicines metabolised by these enzymes should use FLORA FORCE® TURMERIC capsules cautiously. Some of these medicines include calcium channel blockers, chemotherapeutic agents, antifungals, glucocorticoids, alfentanil, cisapride, fentanyl, lidocaine, losartan, fluoxetine, omeprazole, ondansetron and fexofenadine. There is some evidence that Curcuma longa as in FLORA FORCE® TURMERIC capsules, may increase levels of certain antineoplastic agents. Some of these include docetaxel, paclitaxel, etoposide, vinblastine, vincristine and vindesine. Theoretically, Curcuma longa may decrease the absorption of iron. Patients taking iron should monitor their iron levels when taking FLORA FORCE® TURMERIC capsules. Adults (18 years and older): Take 2 capsules twice daily with meals or as prescribed. Children (under 18 years of age): Not recommended for use (see “WARNINGS AND SPECIAL PRECAUTIONS”). The following side-effects may occur with the use of FLORA FORCE® TURMERICcapsules. Gastrointestinal disorders: Frequency unknown: Constipation, flatulence and yellow, hard stools, nausea and vomiting, diarrhoea or loose stool, dyspepsia, gastritis, distension and gastroesophageal reflux disease, abdominal fullness and pain, epigastric burning and tongue staining. Skin and subcutaneous disorders: Frequency unknown: Pruritus, pitting oedema, photosensitivity. 60 Capsules packed into 125ml amber glass bottle with light green screw cap and safety seal insert. Store at or below 25 ºC in a dry place. Protect from light. KEEP OUT OF REACH OF CHILDREN. Read more about anti-oxidants in our blog ‘What are anti-oxidants and why do we need them?’. Adaptogenic tonic herb used in treating low energy states and fatigue. Improves vitality, restores normal sleep patterns, improves heart function. Helps recovery from long-term over-exertion from sport and physical stress. Supports recovery after chemotherapy and radiotherapy and during convalescence. May relieve hypertension, rheumatism, fibromyalgia, depression and Alzheimerâs. Supports recovery from drug addiction. Acts as hormonal regulator â useful in weight management. 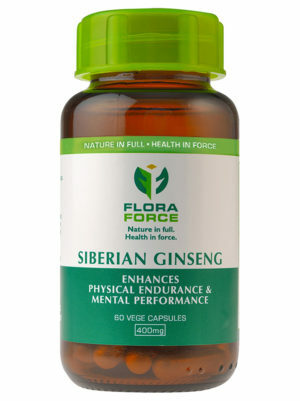 Siberian ginsengâs action is circulatory and as an immune stimulant. It has a detoxifying anti-inflammatory action. 400mg, 60 capsules. Anti-ageing properties prevent degenerative disease by reducing free radicals. The anti-oxidant properties of the catechins in green tea reduce free radicals and have a detoxifying action. 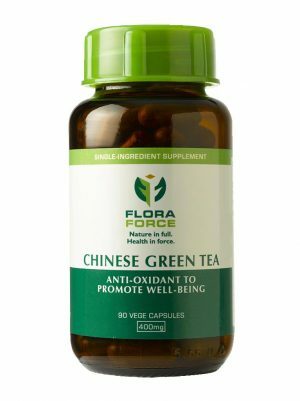 The flavonoids have an anti-inflammatory and protective action against cardiovascular diseases and strengthen blood vessels. Used in weight management. 400mg, 90 capsules. 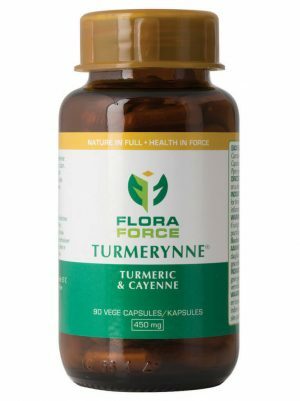 FLORA FORCE® TURMERYNNE® capsules with turmeric, cayenne and black pepper, provide antioxidants for the maintenance of good health, and may reduce inflammation. Preliminary research suggests that turmeric (Curcuma longa) and its active constituent, curcumin, may have antioxidant effects. These help to scavenge free radicals. Curcumin also has an anti-inflammatory action. The major active constituent in Cayenne (Capsicum minimum) is capsaicin. Various studies suggest that Capsicum minimum and capsaicin have antioxidant effects and decrease inflammation. Piperine, the active constituent found in Black Pepper (Piper nigrum) increases the oral absorption and bio-availability of other substances. Avoid taking TURMERYNNE® capsules if you are pregnant or breastfeeding. Vege caps. Free from additives, sugar and lactose. Read all of this leaflet carefully because it contains important information for you. TURMERYNNE® capsules are available without a doctor’s prescription, for you to treat a mild illness. Nevertheless, you still need to use TURMERYNNE® capsules carefully to get the best results from it. Do not share TURMERYNNE® capsules with any other person. Inactive ingredients are vegetable capsules. TURMERYNNE® capsules are free from sugar and lactose. If you are allergic to any of the ingredients in TURMERYNNE® capsules. If you have a bile duct obstruction or gallstones. If you have a bleeding disorder (see “Take special care with TURMERYNNE® capsules”). If you have gastro-oesophageal reflux disease. If you have low iron levels (see “Take special care with TURMERYNNE® capsules”). If you are undergoing surgery (see “Take special care with TURMERYNNE® capsules”). If you are pregnant and breastfeeding (see “Pregnancy and breastfeeding”). Suffer from a bleeding disorder. You may have to arrange increased monitoring of your blood levels when starting or stopping treatment with TURMERYNNE® capsules (see “Do NOT take TURMERYNNE® capsules”). Suffer from iron deficiency. You may have to arrange increased monitoring of your iron levels (see “Do NOT take TURMERYNNE® capsules”). If you are undergoing surgery, discontinue use at least 2 weeks prior to the procedure (see “Do NOT take TURMERYNNE® capsules”). Suffer from a hormone-sensitive cancer. Theoretically, turmeric might have mild estrogenic effects. Until more is known, women with hormone-sensitive conditions should use turmeric cautiously. Take warfarin or other blood thinning medicines. You may have to arrange increased monitoring or your INR (International Normalised Ratio) levels when starting or stopping treatment with TURMERYNNE® capsules (see “Taking other medicines with TURMERYNNE® capsules”). The use of TURMERYNNE® capsules in children and adolescents under 18 years of age is not recommended due to lack of adequate data (see “HOW TO TAKE TURMERYNNE® capsules”). Taking TURMERYNNE® capsules with food and drink: TURMERYNNE® capsules should be taken after meals with water. Pregnancy and breastfeeding: Safety of TURMERYNNE® capsules during pregnancy and breastfeeding has not been established. Avoid taking TURMERYNNE® capsules if you are pregnant or breastfeeding. If you are pregnant or breastfeeding your baby, please consult your doctor, pharmacist or registered healthcare practitioner for advice before taking TURMERYNNE® capsules. Please discuss the use of the following medicines in combination with TURMERYNNE® capsules with your pharmacist or registered healthcare practitioner. Rifampin, an anti-biotic, for the treatment of tuberculosis. Warfarin or other blood thinning medicines. TURMERYNNE® capsules may potentially increase the effect of blood thinning medicines (see “Take special care with TURMERYNNE® capsules”). Epilepsy / seizure medication (such as carbamazepine and phenytoin) as TURMERYNNE®capsules may increase the effect these medications. Please consult your doctor in case of increased seizure activity. Anti-diabetic medicines as TURMERYNNE® capsules may further lower blood sugar levels. Monitor you blood glucose / sugar levels regularly if you are usingTURMERYNNE® capsules and anti-diabetic medicines in combination. Medications activated by cell plasma membrane systems (P-Glycoprotein Substrates) as TURMERYNNE® capsules may affect the activity of these systems and increase how much of some medications get absorbed. Midazolam as TURMERYNNE® capsules may increase its sedative effects. Medicines which are changed and broken down by the liver (Cytochrome P450 3A4 9CYP3A4) substrates) as TURMERYNNE® capsules can influence the absorption and effectiveness of these medicines. Iron as TURMERYNNE® capsules may decrease the absorption of iron. You may have to arrange increased monitoring of your iron levels when taking TURMERYNNE® capsules. Gastrointestinal disturbances, such as: Stomach discomfort, stomach pain, indigestion, diarrhoea, constipation, hard yellow stools, bloated stomach, heartburn, flatulence, ulcer aggravation, nausea and vomiting. An intense feeling of well-being and giddiness. Dizziness, light-headedness or increased sensitivity to pain. A hypersensitivity to any of the ingredients in TURMERYNNE® capsules. Bleeding disorders (see “WARNING AND SPECIAL PRECAUTIONS”). Hypertension (see “WARNINGS AND SPECIAL PRECAUTIONS”). Iron deficiency (see “WARNINGS AND SPECIAL PRECAUTIONS”). Pregnancy and lactation (see “PREGNACY AND LACTATION”). Theophylline: Capsicum spp. and piperine may enhance theophylline absorption. Lithium: Piper nigrum may increase levels of lithium. Rifampin: piperine might increase absorption.